The Jones family has been building stills and making moonshine for generations. We'd love to share a sip of our family tradition with you. Come see us anytime – we’re open 7 days a week. Tours start at the top of the hour. 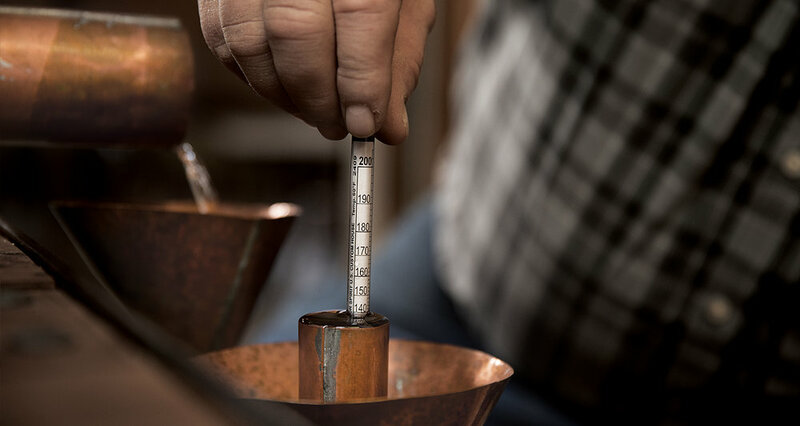 If you want to be sure to see the moonshine coming off the still, call us and we’ll let you know the best time to arrive so you don’t miss a drop. If you have a group of 10 or more, give us a heads up at 270-839-9987 so we can make sure everything's perfect when you get here. While you’re here, enjoy a drink in our lounge, treat yourself in the gift shop, wander through our 73 acres of beautiful Kentucky countryside, relax by the pond or all of the above. Whether you’re dropping by for a drink or for the day, Casey Jones Distillery is a guaranteed good time. If you’re here while we’re running a batch of shine, you can get a sip straight off the still. Casey’s Barrel Cut gets its name and its flavor from premium oak charred barrels. We hand test each run to make sure it’s the right proof. We only use the heart of the run for our signature moonshine.